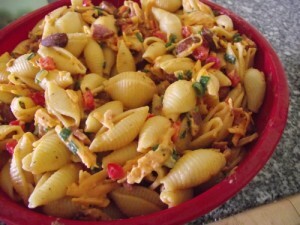 Cook which ever type of pasta you prefer and then cool in cold water to stop further cooking. You should have about 4 cups pasta once cooked (Shells work great because they hold the sauce well). Mix everything together and chill for at least an hour before serving.